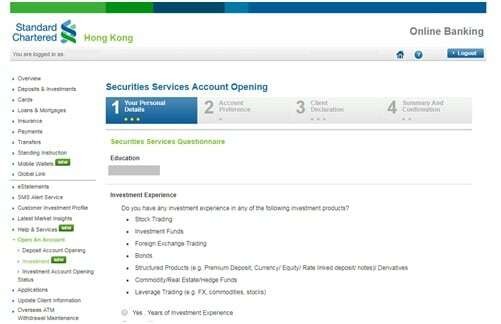 What can Standard Chartered Bank Online Securities Services do? What kind of shares can I trade online? Currently, you can trade all securities listed on The Stock Exchange of Hong Kong Limited (SEHK) and Shanghai A shares under Shanghai-Hong Kong Stock Connect through our Online Securities Services. Can I trade stocks listed on the Growth Enterprise Market (GEM) online? Yes, you can trade GEM stocks through our Online Securities Trading Platform. Yet for some customers who have opened the securities account in early years, in which the account opening documents did not cover relevant Risk Disclosure Statements regarding GEM, they need to sign up separate Risk Disclosure Statements before being able to trade GEM stocks (this restriction applies on both Online Securities Trading and Phone channel). Please contact our Securities Services Hotline at 2886 6266 or visit any one of our branches if you have any questions. What are the benefits of trading online? Online trading allows you to get access to important trading information before you make an investment decision, e.g. your stock holdings, Available Purchasing Power and the latest stock price movement. Are there any FREE real-time quotes? Yes, you can enjoy unlimited free basic real-time quotes. A number of FREE real-time detailed quotes are also available for your use once signing up our Online Securities Services, depending on your banking relationship with us. Each successful trade will give you an additional 100 FREE real-time detailed quotes in the month you trade. The more you trade, the more bonus FREE real-time detailed quote you can earn. Please note that all your executed orders placed through the same channel (online or phone) on the same stock and same instruction side in one trading day are considered as one executed trade. Any unused bonus free real-time detailed quotes earned in a month will expire at the end of the following second month. The number of free real-time detailed quotes you are entitled in the month will be reflected in the "Unused Quote" of the Online Securities Trading screen on or before the 3rd business day of the month. the real-time detailed quotes you used in last month (if any). Our Online Securities Trading System assists you to monitor your entitled free detailed quotes for the month. It will display the 1st alert message upon your remaining number of free real-time detailed quotes falls to '10'; and will display the 2nd alert message upon all your free real-time detailed quotes have been used up. Customer's real-time detailed quote usage in a month that exceeds customer's entitled free detailed quotes for the month is subject to a charge according to our Service Charges schedule. Can I get the latest market news from Online Securities Services? 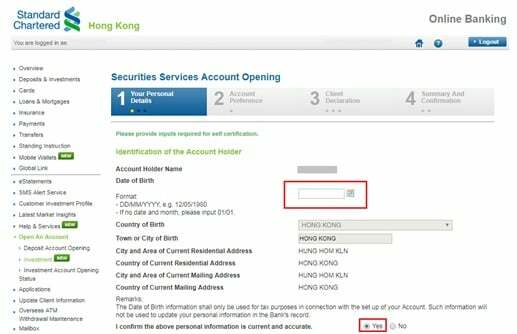 Yes, the Bank has arranged a registered Information Vendor of HKEx Information Services Limited to provide professional and comprehensive market information. You can enquire the information under "Market Express" on the left navigation menu. 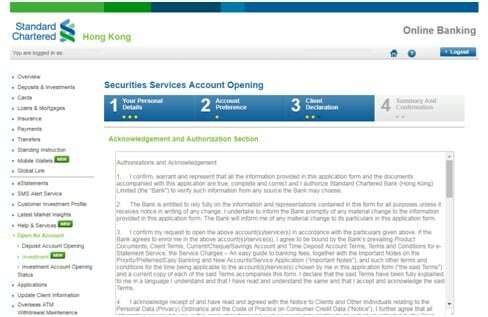 How do I open Securities Account online? 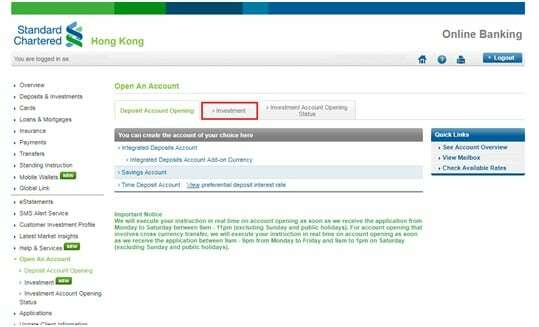 1.After logging in Standard Chartered Online Banking, click “Open an Account” at the left. 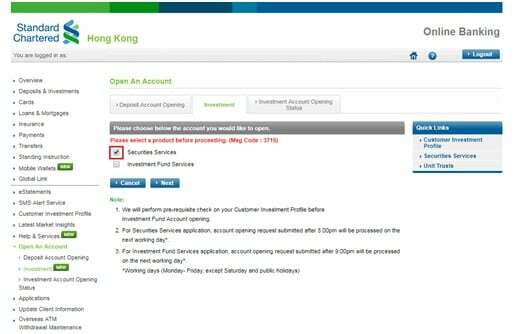 3.For opening Securities Account only, check “Securities Services” and click “Next”. 4.Input your date of birth in DD/MM/YYYY format, and check the information shown under “Identification of the Account Holder”. Confirm it is current and accurate by clicking “Yes”. 5.Read through the “Acknowledgement and Certification”, and check the box if you have read and agree to the Acknowledgement and Certification. Then click “Next”. You may refer to the “Note” for further information. 6.Check and confirm the “Personal Details” shown on the page. Choose preferred mode of communication for order confirmation alert, language preference and Relevant Individual related information. 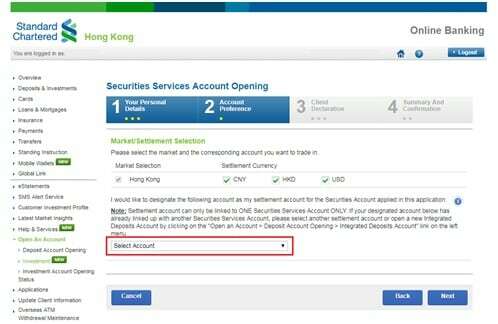 8.Select an account as the settlement account for your new Securities Account. Please be reminded that one settlement account can only be linked to ONE Securities Account only. 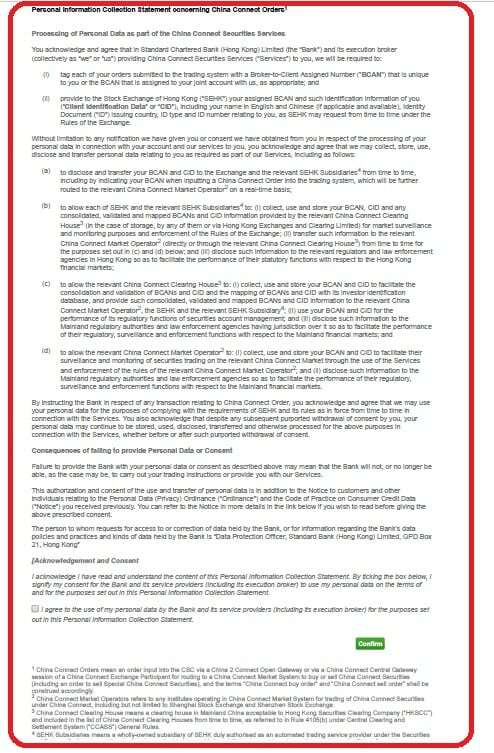 9.Read through “Disclosure Statement and Declaration”. Click “Accept and proceed’. 10.Read through “Acknowledgment and Authorization Section”. Click “Accept and proceed”. 11.Read through “Terms and Conditions for Securities Services”. Check the box to confirm you have read and accepted all the Terms and Conditions. Then Click “Next”. 12.In the “Summary And Confirmation” part, check all the information carefully. Click “Next” to confirm and submit. 13.After application submission, you will be provided a reference number for checking the application status and handing in supplementary document (if applicable). It takes about 3 working days under normal circumstances, if there is no any additional document required to be provided. How can I know if any additional document I need to submit? If there is any additional document that you need to submit, you will be noticed by SMS and email. Please note that we will not proceed your application until the requested document is well received, and the incomplete application will be cancelled automatically after 30 calendar days of the submission. How should I submit additional document? You can submit the requested document, e.g. residential address proof, employer consent, to any of our branches quoting the application reference number, or send it to below mailbox. Can I sign up for Shanghai-Hong Kong and Shenzhen-Hong Kong Stock Connect Northbound Trading Services in Online Banking? No, at this stage, you cannot sign up for these two services in Standard Chartered Online Banking. Please kindly go to any of our branches for assistance. If I still have question about the online Securities Account application, what should I do? If you have any enquiry, please feel free to contact our Securities Services hotline at 2886 8868 (1-3-4). Do I need a specific computer for using Online Securities Services? No, you can use any personal computer with proper security protection and internet access to use Online Securities Services. 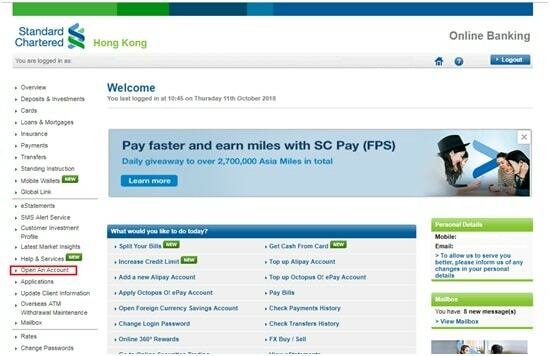 Yet do NOT conduct your Standard Chartered Online transactions using public or shared computer. 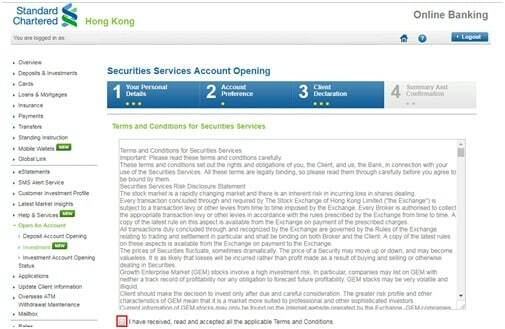 How can I start trading via Online Securities Services? An One-time Password (OTP) will be sent to your mobile phone through SMS. Enter the OTP as shown in the picture. If you have not entered the OTP within time limit, please click “Resend OTP”, a new OTP will be sent to your mobile phone. Enter the password and click “Confirm” immediately. After enrolling the Online Securities Services, can I still trade through other channel(s)? You can still trade through other channels such as our Securities Services Hotline (2886 6000 for Priority Banking customers/ 2886 7000 for Premium Banking customers/ 2886 8000 for Easy Banking and non-Relationship Package customers). Can I set my 1st landing page as Trading page after clicking "Securities Services"? Yes, you can set your 1st landing page at "Trading" or "Your Stock Portfolio" page under "My Preferences" on the left menu. Default landing page is "Your Stock Portfolio". I see an error screen “This page can’t be displayed” when I visit stock quotes related pages, what can I do? Our stock quotes pages require turning on TLS 1.0, 1.1 and 1.2 in your computer, therefore, your browser should be able to support TLS1.2. Please refer to the table below for the browser versions which support/ do not support TLS1.2. If your browser version does not support TLS1.2, please kindly upgrade your browser in order to enjoy the stock quotes service. 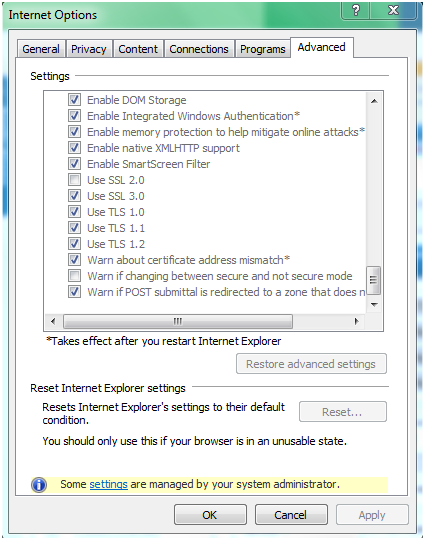 How can I enable TLS1.1 and/ or TLS1.2 on web browers for using stock quotes service? To enable TLS 1.1 and/or TLS 1.2 protocols on web browsers, see the list below. Why I was being logged out when I was using securities services and refreshed my page? What should I do? 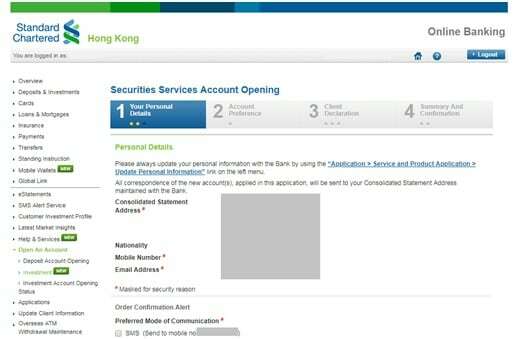 Due to online security reason, refresh function is not supported in the securities services webpage, please login again. If you would like to refresh any page under Market Information tab, you could click the green “Refresh” button on the top right corner, example as below. Can I place an order outside trading hours via Online Securities Services? Other order types including but not limited to Enhanced Limit Order/ CAS* At-Auction Limit, Stop Loss Order and GTD Limit Order 24 hours except 5:00 a.m. – 7:00 a.m.
*CAS refers to Closing Auction Session. When a valid order is received by our trading system after 4:10 p.m., the order will be stored in our system and processed on the next trading day. Customers are advised to check their order status and that the above order arrangement meets their trading need. After entering my orders into the system, will they be sent to the Bank straight away? An order is submitted successfully only when you see the order acknowledgement screen with the Order Reference Number. How do I know the order is received by the Bank? After you have entered and confirmed the order/instruction details, an Order Acknowledgement Screen with an Order Reference Number will be displayed. This represents the order is received successfully by the Bank but it does not guarantee that your order will be executed or executed in a timely manner in the market. The Bank will process your order on a best effort basis but it may NOT be executed due to fluctuation in stock price, insufficient market liquidity, system failure or any other events beyond the control of the Bank. It is a good practice and your responsibility to enquire the order status through the "Order Enquiry" page. Should you come across any difficulties in accessing or have any queries about the execution status of your orders, you can also call our Securities Services Hotline(2886 6000 for Priority Banking customers/ 2886 7000 for Premium Banking customers/ 2886 8000 for Easy Banking and non-Relationship Package customers). How do I know the order is executed or rejected? Acknowledged/Acknowledged (Action) This means your order is successfully received by the Bank and is open for execution, cancellation or amendment and/ or with action status. For order submitted during trading hours, the order would have been sent to the Bank’s execution broker for execution. For order submitted beyond trading hours, the order would be sent to the Bank’s execution broker as per the timeline agreed by the Bank and its execution broker. Please note even an order has first been received by the Bank and its execution broker, the order may still be rejected upon it is sent to the Bank’s execution broker or the Exchange respectively after performing the applicable price validation checks. Clients are strongly advised to check the order status from time to time through Online Banking or refer to the Order Confirmation SMS/ Email sent by the Bank (applicable if the client has subscribed for Order Confirmation SMS/ Email services). Not Fully Filled Market order not fully filled and has expired. Note: Action in the bracket of the order status indicates the action status raised by the customer to the order. Pending cancellation Order cancellation is received by the bank but not yet acknowledged by the market. Order cannot be further modified/cancelled in this case. Pending Modification Order modification is received by the bank but not yet acknowledged by the market. Order cannot be further modified/cancelled in this case. Market Order Completed Market Order is partially filled and has expired. Can I place a Morning At-Auction Limit Order, Enhanced Limit Order/ CAS At-Auction Limit Order where the order limit price is far away from market price? Yes, you can specify your desired limit price for both the Morning At-Auction Limit Order and Enhanced Limit Order/ CAS At-Auction Limit Order. 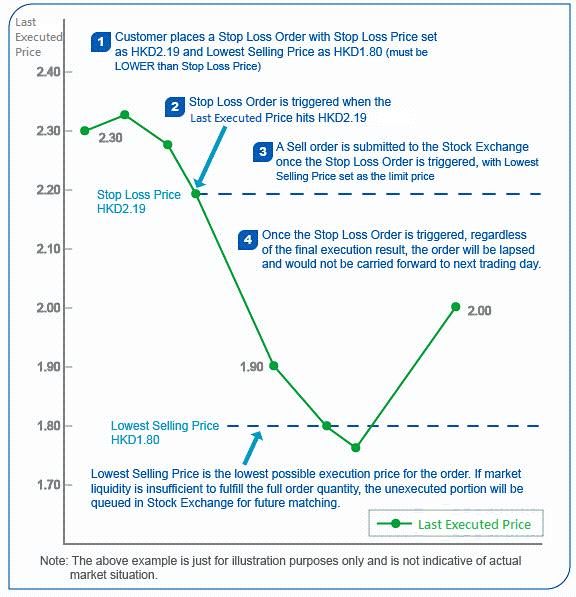 The order will be monitored by the Bank’s system and sent to the Stock Exchange of Hong Kong (“SEHK”) when the limit order price falls within the acceptable range specified by the Stock Exchange Trading Rules. The acceptable range of price limit is as below. Clients may check the order status through online banking or refer to the Order Confirmation SMS/ Email sent by the Bank (applicable if the client has subscribed for Order Confirmation SMS/ Email services). The Bank reserves the absolute right to change the above mechanism without prior notice. Can I sell the stock I buy today? Yes, you can sell the stock before settlement date as long as the buy order of the day has been partially or fully executed. Can I amend or cancel an order? Yes, you can amend or cancel any outstanding (i.e. partially filled or open status) order via Online Securities Services under "Order Enquiry" page. Simply go to "Order Enquiry" page, press "Modify" or "Cancel" button for the order which you want to modify or cancel. For a partially-filled order, only the remaining portion which has not been filled can be modified or cancelled. When customer modifies the order price for an open Enhanced Limit Order which is queued in the SEHK, the order queuing in the SEHK will be cancelled, and the order with the modified price, if within 24 spreads of the prevailing nominal price, will be sent to the SEHK, otherwise, it will be stored in our system for monitoring and be sent to the SEHK when the aforementioned price condition is met. Also, the Limit Order Price of an outstanding Enhanced Limit Order being queued in the SEHK cannot be changed to a price level that is higher than the prevailing ask price (for buy order) or lower than the prevailing bid price (for sell order). For an open order, the order quantity cannot be increased. In case customer wishes to increase the order quantity, customer should either place a new order with incremental quantity or cancel the original order first and then place a new order with the new order quantity. During the Pre-opening Session, all orders cannot be modified or cancelled when Order Input Period for the session ends (at 9:15 a.m.). During the Closing Auction Session, all orders cannot be modified or cancelled when Order Input Period for the session ends (at 4:06 p.m. on normal trading day /12:06 p.m. on half trading day). Please note that this only represents the Order Change Request would be submitted to the Bank and this does not guarantee the order can be changed or cancelled successfully in the market. Customers are always advised to check the order status through "Order Enquiry" page. Will the Bank handle my instruction on the same trading day after I amend/cancel the order? Order amendments or cancellations made during trading hours will be handled on the same trading day upon receipt of instructions provided that the order has not been fully executed or cancelled. Before an amendment request has been duly processed, we cannot entertain another amendment instruction on same order. Once a cancellation instruction is placed, you cannot withdraw your cancellation instruction or make further amendments to same order. During public holiday or system back-out period (11:00 p.m. to 8:30 a.m. of every SEHK trading day) For "Buy" order, no order amendment can be accepted but only order cancellation. If you would like to amend your outstanding buy order, you have to cancel it first and place a new order. What does Order Types mean? Enhanced Limit Order An Enhanced Limit Order allows you to set the maximum price you will pay when buying or the minimum price you will accept when selling. This can reduce the risk of paying more or receiving less for an order than what you expect. An Enhanced Limit Order is tracked by the Bank's system and only sent to the SEHK for queuing when its limit price falls within 24 spreads of the prevailing nominal price. The Bank reserves the absolute right to change this mechanism without prior notice. When submitted to the SEHK, it allows matching of up to 10 price queues (i.e. the best price queue and up to the 10th queue at 9 spreads away) at a time provided that the traded price is not worse than the input price. The sell order input price cannot be made at a price of 10 spreads (or more) below the current bid price whereas the buy order input price cannot be made at a price of 10 spreads (or more) above the current ask price. Any outstanding Enhanced Limit Order in SEHK trading system will be treated as a limit order and put in the price queue of the input price. Morning At-Auction Limit Order Morning At-Auction Limit Order is a limit order with a specified price for single price auction during Pre-opening Session. Morning At-Auction Limit order for Pre-opening Session can be placed 24 hours except 9:15 a.m. to 4:10 p.m. of every trading day. Customer should note that both the Indicative Equilibrium Price (IEP) or spread range of the prevailing IEP may affect whether the order can be captured by the SEHK or that the order can be executed. CAS At-Auction Limit Order CAS At-Auction Limit Order is a limit order with a specified price for single price auction during Closing Auction Session. CAS At-Auction Limit order for Closing Auction Session can be placed from 4:00 p.m. till the end of the Closing Auction Session of full trading day. It can be placed from 12:00 p.m. till the end of the Closing Auction Session of half trading day. All unexecuted CAS At-Auction Limit Order will be expired when the Closing Auction Session ends. A Market Order is an order without specifying the price that allows customers to buy or sell securities at the prevailing market price. It helps customers to avoid missing investment opportunity caused by setting a specific limit price. A Market Order that is entered into the trading system will be executed at the prevailing market price at time of execution. However, customers should be aware that the final executed price may deviate considerably from the market price at the time of order placement due to market fluctuation and technical factors, especially at the beginning of morning and afternoon trading sessions due to the possible accumulation of orders submitted before market open. Customers are also advised that a Market Order may only be partially-filled, and in some scenarios, cannot be filled for any order quantity. Customer should from time to time check the execution status of Market Order from the "Order Enquiry" page. How is a Market Order being executed? Upon customers' confirmation, the Bank will send out Special Limit Order to the Stock Exchange of Hong Kong Limited. The order will be matched with the five best price queues at the market (prevailing best queue and up to the 5th queue at 4 spreads away at the time when the market order is being processed) with up to a maximum of 4 spreads above the prevailing best ask price for buy orders or below the prevailing best bid price for sell orders at the moment of order placement. If all quantities are filled, the Market Order is fully executed. Otherwise, any unfilled quantity of the order from the first round of matching will be re-submitted into the market instantly for a maximum of 2 extra attempts of matchups. After all 3 attempts have been completed, any remaining unfilled order quantities will be automatically cancelled. In this case, the order status will still be described as "Fully Executed" referring that the Bank has already completed the whole processing of the Market Order at bank's level. Customers are advised to click on the Order Reference hyperlink of the order from time to time to fetch the detailed order execution status in "Order Status Details" page. Customer X has placed a market order to sell 250,000 shares of Stock XYZ. Assume that the prevailing best bid price of the stock is HK$16.00, and the price spread is HK$0.02. Under the condition that the Bank will match the market order up to a maximum of 4 spreads from the prevailing best bid price, the Bank will only execute the order when the price is HK$15.92 or above. Execution Result: The Market Order is fully executed by selling all 250,000 shares after matching with the five best price queues in the prevailing market condition. Execution Result: As there are only 95,000 share queuing in the market with prices at or within 4 spreads away from the best bid price upon order submission, the first round of submission can only fill up 95,000 shares. The order (with the remaining unfilled order quantity 155,000 shares) is resubmitted into the market for a second matchup. Execution Result(2): A further 85,000 shares are filled up.The 3rd round of order (with order quantity 70,000 shares) is resubmitted to the market for a final matchup. Execution Result(3): In the final round of submission, as there are only 22,000 shares queuing at market with bid price higher than the lowest limit ($15.92, 4 spreads below the prevailing bid price at time of order placement), the Market Order can only be further filled for 22,000 shares. The unfilled portion of the order (i.e. 48,000shares) will be automatically cancelled. Execution Result: Although at the time of order placement, the prevailing bid price is $16.00 with outstanding queues. However, due to market fluctuation and as when the order reaches SEHK, if the prevailing best bid price falls to $15.90, the Market Order will be rejected. Customer needs to re-submit a new Market Order in this scenario. What is Stop Loss Order? Stop Loss Order is a sell instruction that allows you to preset the selling price range, i.e. Stop Loss Price and Lowest Selling Price. Once the last executed price of the securities hits or falls below your pre-set Stop Loss Price but still higher than the Lowest Selling Price, your sell order will be submitted to the market with the Lowest Selling Price set as the Limit Price of the sell order. Please note that the Lowest Selling Price must be set within 20 spreads away from the Stop Loss Price. Otherwise, the order may be rejected when it is triggered. However, a full / partial execution is not guaranteed as there may be outstanding orders from other investors in the order queue ahead of yours and order execution is also subject to certain factors including but not limited to market fluctuation and market liquidity. The order may be fully executed, partially executed or even unexecuted. The executed price may also be Better, Equal To or Worse than your specified Stop Loss Price but would not be lower than your Lowest Selling Price. Please note that once the Stop Loss Order is triggered, regardless of the final execution result at the end of the trading day, the order will lapse and will not be carried forward to next trading day. For a Stop Loss Order, only cancellation request would be accepted. If you wish to modify an outstanding Stop Loss Order, you have to cancel it first and submit a new order. Also, Stop Loss Order is not applicable for Pre-opening Session. What is Stop Loss Price? Stop Loss Price is the selling price pre-set in Stop Loss Order. If the last executed price of the securities hits or falls below this Stop Loss Price, the Bank's system will place the sell order to the market with the Lowest Selling Price set as the limit price. What is Lowest selling price? Once the Stop Loss Order is triggered, it will be executed only when the selling price is not lower than this pre-defined Lowest Selling Price. It helps to limit your losses amid volatile market conditions. Please note that the Lowest Selling Price must be set within 20 spreads away from the Stop Loss Price . Otherwise, the order may be rejected when it is triggered. What do I need to know about Secondary Market Trading of iBond in the SEHK and its trade settlement? Customers can trade IBOND in the SEHK conveniently via OST, Breeze Trade, or Securities Hotline. Customers need to beware that the accrued interest of the IBOND would be taken into account to derive the settlement amount of the trade. The accrued interest is normally paid from the IBOND buyer to the IBOND seller (existing IBOND holder) for holding the bond from the last interest payment date until the trade settlement date. The relevant accrued interest of the IBOND would be added to customer's transaction amount for trade settlement. The indicative per annum interest rate, R is determined and announced on the relevant interest determination dates. Before the first interest payment date R will be the one announced by the Government in advance. This rate is determined based on the higher of the Fixed Rate or Floating Rate on the announcement date of the relevant IBOND. Please note that this is not the actual per annum interest rate for the first interest payment date. After the first interest payment date R will be that of the immediate preceding interest payment date. On the actual interest payment day No accrued interest is required to be applied to derive the settlement amount. For these trades, the IBOND seller is entitled to the interest payment distributed on interest payment day, and the IBOND buyer is not entitled to it. D is the number of calendar days counted from the last interest payment date prior to the trade settlement date to the Trade Settlement Date (both days inclusive) minus 1 day. In the case the Trade Settlement Date is before the first interest payment date, D is the number of calendar days counted from the iBond issue date to the trade settlement date (both days inclusive) minus 1 day. When can I trade iBond? You can place iBond orders according to the timetable below. What types of order are accepted for iBond? All types of orders are accepted except Good-Till-Day Order. What is the order price limit range for iBond? The allowable price limit range for iBond is as below. My market order is rejected with a reminder “Since market order is subject to quantity restriction and your input of quantity exceeds the allowed range, your order has been rejected.” What should I do? You may consider to reduce the quantity of the stock in the market order or try to place Enhanced Limit Order. What is Closing Auction Session (“CAS”)? CAS allows execution at the closing price. During a closing auction, if you are interested in trading at the closing price, you may input buy and sell orders. The orders in the market will then form a consensus closing price for each security and orders are executed at that price. CAS commences immediately after the completion of the normal trading hour. What securities are eligible to CAS? In Phase 1 (From 25th July 2016), all the Hang Seng Composite LargeCap & Composite MidCap Index constituent stocks, the H shares which have corresponding A shares listed on Mainland China securities exchanges, and all ETFs are eligible to CAS. In Phase 2 (tentatively 6 months after Phase 1 subject to a review), all equity securities and funds not covered in Phase 1 are eligible to CAS. What is the time frame of CAS? What types of orders are accepted during CAS? By what means? You can select the order type of “Enhanced Limit Order/ CAS At-Auction Limit Order” or “GTD Limit Order” during CAS and the orders can be placed via online securities trading, SC Equities and securities hotline. What is random closing during 4:08 – 4:10 p.m. / 12:08 – 12:10 p.m.*? The market closes randomly within two minutes. After the period, there is order matching for all CAS securities. What is the price limit I can refer to for inputting orders during CAS? When can I place new order, amend or cancel order? Allow to Input New Order? Allow to Amend/ Cancel Order? What will it be if I place a new day order during random closing period but the market has been closed randomly? The order will be acknowledged, but will not be executed. What do I need to note when I place new order during Reference Price Period? The orders input during Reference Price Fixing Period (4:00 – 4:01 p.m. / 12:00 – 12:01 p.m.*) will be stored at the Bank’s system according to input time sequence and will be sent to the HKEx when Order Input Period begins at 4:01 p.m. / 12:01 p.m.*. If there is no trade matching during CAS, what is the closing price of the CAS securities? In this case, the reference price will become the closing price of the day. When can I input next day order? You can place next day order after CAS, that is after 4:10 p.m. of the trading day. Would the CAS apply to Stock Connect? The CAS would apply to Stock Connect Southbound brokers and investors, and would include all current Stock Connect stocks for Southbound trading in Phase 1. Will Stop Loss order be triggered during CAS? Stop Loss order will not be triggered during CAS. Reference price and Indicative Equilibrium Price (IEP) will not trigger Stop Loss Order. What information can I obtain as reference for the Closing Auction Session? Information listed below can be obtained from our Online Securities Service Platform and SC Equities Mobile App. * Applicable to Half Trading Day which is on the eves of Christmas, New Year and Lunar New Year. What does "Available Purchasing Power" mean? "Available Purchasing Power" can be enquired upon the "Trading" pages. Please note that for a Sell transaction completed TWO days before a non-trading day, the accrued but unsettled sales proceeds will NOT be counted in "Available Purchasing Power" during the non-trading day. It will only be counted as "Available Purchasing Power" on the subsequent trading day. What is the amount of fund to be held after placing a "Buy" order? Will there be any adjustment of hold fund after the order is executed? On the order execution date, hold fund will be adjusted at night according to the actual debit amount and the exact amount will be debited from settlement account on T+2 days. Will hold fund apply if there are funds from “Sell” order? If the "Sell" order is filled before placing the "Buy" order, hold fund may not be necessary if the sales proceeds can totally finance the "Buy" order. If the sales proceeds cannot fully cover the "Buy" order, the Bank will only hold the net amount. If the "Sell" order is filled only after "Buy" order, hold fund will be adjusted upon the "Sell" order is filled. Please also note that fund will be hold for any unsettled “Buy” order amount during weekends and holidays even though you have any unsettled “Sell” Order which can totally/partially finance the “Buy” Order. When will the hold fund be released? For buy order submitted before 4:10 p.m. on a trading day, hold fund will be released (i) immediately upon the buy order is successfully cancelled, or (ii) before 7:00 p.m. on that trading day after the buy order is expired. For buy orders submitted after 4:10 p.m. of a trading day, fund held for the buy order will only be released after 8:30 a.m. on the next trading day if customer cancels the buy order after 7:00 p.m. on the day of order placement. Fund hold adjustment will also only take place after 8:30 a.m. on the next trading day if customer reduces the order quantity or order price after 7:00 p.m. on the day of order placement. Will there be any instant notification after order is executed? You may receive SMS and/or Email confirmation when your order is partially executed or fully executed. If you want to enjoy this complimentary instant order notification service, please call our Securities Services Hotline or visit any one of our branches for registration. Once you have registered this service, all orders placed via Online Securities Services or Securities Services Hotline will enjoy this instant notification service. Will there be price alert services when a stock has reached my target price? Yes, you can place your stock watch under "Price Alert" function on left menu. There will be email or SMS alert once the price reached the target. The Bank will charge the customer for each SMS alert sent. Customer should refer to the Service Charges Booklet for the charge. Can I change my mobile number or email address via online? For instant order notification, both mobile number and email address need to be pre-registered and cannot be changed via online. Please visit any one of our branches for mobile phone number and email address changes and these changes will be applied to the Bank's record for future communication. For price alert service, you can change the mobile number and email address via online. This change will not alter your records maintained with the Bank. Any charges for email or SMS notification? All order notifications are free of charges. However, for price alert, it will be subject to charge accordingly. For details, please refer to the "Service Charges Booklet". Where can I find the Corporate Action function in Online Securities Trading? It is under “Manage” tabpage. It supports clients to submit Corporate Action instructions online. What are the Corporate Action events supported by Online Securities Trading platform? The “Corporate Actions” function in Online Securities Trading platform supports voluntary corporate action event types, including Dividend Payment with Options (DVOP), Tender Offer, Open Offer and Rights Issues . I would like to submit instructions for the Corporate Action that I am entitled, but why it is not shown in the "Corporate Actions" page? If you cannot submit instructions using our online corporate action functions, please call our Securities Services Hotline at 2282 0898 to give the corresponding instructions.Only clients who are entitled to the corporate action events will see the details of the corporate actions under the Corporate Action tabpage. What is the meaning of the status in Corporate Action tabpage? Pending Client can view Corporate Action details and input selections. Submitted The instruction has been submitted to the bank . Closed This event has passed the submission deadline and client is not allowed to input/change instruction. Attention This means there is unmatched quantity or insufficient fund in relation to your instruction. If the instructed quantity is less than the eligible quantity under Dividend Payment with Options, Open Offer, Tender Offer and Right issues, the Bank will not proceed on the remaining quantity you have. E.g. Client is entitled to 10,000 rights and the client entered 9,000 to exercise rights, the bank will not take any action for the 1,000 rights for the client . If the instructed quantity is greater than eligible quantity under Dividend Payment with Options , Open Offer and Rights issues, the bank will consider the instructed quantity is equal to eligible quantity. E.g Client is entitled for 10,000 rights, and exercised 10,000 and sold 1000 rights later. The eligible quantity becomes 9,000. In this case, the bank will exercise 9,000 rights on behalf of the client. If the instructed quantity is greater than eligible quantity under Tender Offer, the bank will not take any action for the submitted instruction in this case. E.g. Client is entitled for 10,000 shares, and entered 10,000 shares to receive cash and sold 1,000 shares later. The eligible quantity becomes 9,000. In this case, the bank will not take any action for all the eligible quantity. If “Attention” due to unmatched quantity is shown on [what is return means?] next day of Last Reply Date/Time (due to trading/transfer out of the shares), client who wish to revise the instructed quantity should call our Hotlines at 2282 0898 before 5:30p.m. If “Attention” due to insufficient fund is shown on the next day of Last Reply Date/Time, client is advised to inform Hotlines at 2282 0898 after transferred fund to his/her settlement account. Otherwise, the bank will not take any action for the submitted instruction. Client can revise the instructed quantity online if required or call Hotlines at 2282 0898. For a Dividend with Options event, I am not able to select to receive in other currency. Why? It is because client has not designated a settlement account for the currency he/ she would like to choose to receive the dividend in. If you already have a deposit account in that currency, please call to the Securities Services Hotlines to designate it as the settlement account for the subject currency; or visit any of our branches to open an account in that currency and designate such as the settlement account. The designated settlement account can also be used for trade settlement purpose. System is not able to show the dividend rate or re-investment price for Dividend with Option Corporate Action Event. Why? This is because the FX rate or re-investment price for the dividend has not yet been announced and confirmed by the listed company. Client can still submit instruction to these options. The Bank will base on the announced and confirmed FX rate or re-investment price to determine the final dividend payment to the clients. Will I receive any alert for Corporate Action? Free Email and/or SMS notification will be sent to the client who is entitled to voluntary Corporate Action event types supported in Online Securities Trading platform according to the client’s preference. This is applicable to Dividend Payment with Option, Tender Offer, Open Offer and Rights Issues. This informs clients the entitlement towards the applicable corporate action event, and invites clients to give their instructions before the Bank’s deadline. Please note for Rights Issue, if clients buy the share rights from the secondary market or transfer in share rights from other financial institute, no separate email/ SMS notification on entitlement will be sent out. This is applicable to DVOP, Tender Offer, Open Offer and Rights Issues. This reminds the client the submitted Corporate Action quantity is not fewer than the entitled quantity or the client has not yet submitted an instruction. If client wishes to take the default option for the corporate action event, client can ignore this reminder. This is applicable to Open Offer and Rights issues only. This reminds client to maintain sufficient fund in order to settle the submitted instruction. This is applicable to Open Offer and Rights issues only. This informs client the debit for the submitted instruction for Open Offer or Rights Issue is unsuccessful. Client is advised to deposit the required funding to his/her settlement account before 5:30 p.m. on the same day upon this notification is received and inform the bank by calling 2282 0898. The bank will not take any action to the submitted instruction if client fails to respond. Can I modify my submitted instruction? Submitted Instruction can be modified through both online and Securities Hotline on or before Last Reply Date/Time except which modification instruction for Dividend with Option must be submitted through Securities Hotline. What do I need to do if I want to partially receive shares and partially receive cash for a dividend with option event? Please note that client is required to enter the entitled quantity of the stocks and not the quantity of scrip dividend desired to receive. I have traded shares/rights in the market but the figure shown in the Entitled Quantity column of the 'Corporate Actions' page has not been updated? The Entitled Quantity shows your initial entitlement as amended by any quantity traded by you subsequently in the market as of last trading day for rights issues and that has been settled for tender offer . For example, in a particular rights issue, you initially received 1,000 rights entitlement and today you buy 200 rights entitlement in the market. Your entitled quantity would still show 1000 today. The entitled quantity will only be updated in the next day after the trading day. Also, in a tender offer, you initially entitled for 1,000 quantity of shares and today you buy 200 quantity of shares from the market. Your entitled quantity would still show 1,000 today until the trade has been settled. Why was my corporate action instruction not processed? After submitting your instruction, please make sure you have maintained sufficient funds in your settlement account and entered instruction matches with entitled quantity by the Last Reply Date/time. Otherwise the bank shall have the discretion to stop processing any or all your instructions without prior notice. Where can I find more information before submitting instructions for the respective corporate actions? Client can refer to the corporate action advice that we sent to client for reference. In addition, you should always carefully read the announcements, circulars and other documents issued by the listed company relating to the corporate action before submitting your instructions. 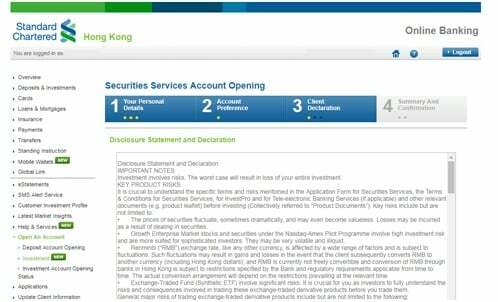 Please visit the Hong Kong Stock Exchange website http://www.hkexnews.hk/index.htm for copies of these documents. Why Historical Corporate Action Events are not showing in the Online Securities Trading? For Historical Corporate Action Events which passed the Last Reply Date/Time for 30 calendar days or more, they will be removed from Online Enquiry. How do I transfer stocks between other bank/financial institution and Standard Chartered Bank? 1. Make sure you have active Securities Account and Settlement Account in Standard Chartered Bank. 2. 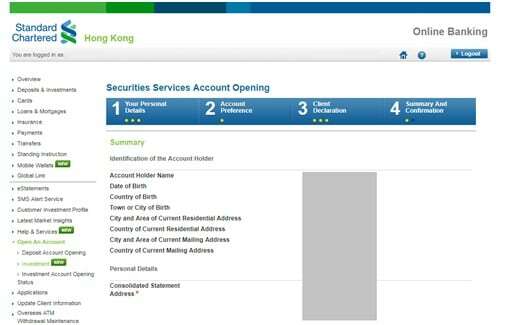 Fill in your personal information, Standard Chartered Securities Account number, and stock details, on “Securities Services Stock Transfer Request” form obtained from branches. 3. If transfer from another bank/financial institution to Standard Chartered Bank, please check “Transfer in from another financial institution to my/our above account number”. 4. If transfer from Standard Chartered Bank to another bank/financial institution, please check “Transfer out to another financial institution from my/our above account number”. 5. Fill in the information of the bank/financial institution that you want to transfer to/from, and make sure the requested information provided in the form is complete and accurate. 6. Read the “Notes” in the form carefully, and sign on the form. 7. Submit the form to any of our branches. 8. Inform the bank/financial institution about the stock transfer details. It must be done by client for both transfer-in and transfer-out. What is Standard Chartered Bank’s CCASS participant ID? For Hong Kong stock transfer, our CCASS participant ID is C00039. For stock connect, our CCASS participant ID is B01161. If I do not have the information of the bank/ financial institution, can I submit the form first and provide the information later? We will not accept and proceed the transfer-in/out request if any information is missing, and the request will be automatically cancelled in 14 calendar days upon the receipt of request submitted. I have a joint name Securities Account in Standard Charted Bank. Can I transfer stock which is only under my name to this account? Stock transfer between single name account and joint name account is not allowed. You should open a single name Securities Account through any of our branches. Can I transfer stock with “delisted” status to Standard Chartered Securities Account? No, we do not accept stock with “delisted” status to be transferred in. I am an European Economic Area (EEA) resident. Can I transfer stocks into Standard Chartered Bank? We are sorry that we are not able to accept any request of transfer-in or physical share deposit from EEA resident. If I still have enquiry about stock transfer, can I go to 15/F Standard Chartered Tower? Counter located at 15/F Standard Chartered Tower can only provide physical share related services. Should you have any enquiry on stock transfer, please feel free to contact our Securities Services Hotline at 2886 6266. 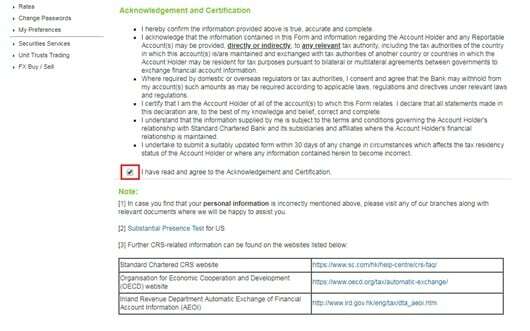 What should I do before depositing physical share certificate to Standard Chartered Bank? 1. Ensure you have active Securities Account and Settlement Account in Standard Chartered Bank, and the account owner must be the same as the owner of the physical share. 2. If the physical share owner comes in person, he/she needs to sign on Transferor column under our staff’s witness, and our staff would sign as witness. 3. If the physical share owner does not come in person, he/she needs to sign on Transferor column, and invite the witness to sign and fill in his/her personal information. We will accept the deposit only when the above is done. Where can I deposit the physical share certificate? You can bring along the physical share certificate and go to 15/F, Standard Chartered Tower, 388 Kwun Tong Road, Kwun Tong, Kowloon. How long does it take for stock deposit? It takes around 14 working days for deposit. It will be available for selling after the 15th trading day if it processes successfully. Is there any charge for depositing physical share certificate? Yes, charges will be imposed per deposit. Please ensure sufficient funds in your Settlement Account. We will debit the charges on instruction create date, instead of effective date. You may refer to the bank charges booklet for details. Why the withdrawn physical share certificate is not under my name? All the physical share certificates withdrawn from CCASS are in the name of “HKSCC Nominees”. If your plan is to re-register the physical share certificate under your name, please present the certificate and the transfer instrument to Inland Revenue Department (IRD), and request for a stamp duty exemption given that there is no change in beneficiary ownership. Then you have to present the certificate and transfer instrument to the relevant Share Registrar. If I still have any question about stock deposit/withdrawal, what should I do? Should you have any enquiry on stock deposit/withdrawal, please feel free to contact our Securities Services Hotline at 2886 6266. How can I do an enquiry on stock quote? You can go to our online securities trading platform. You will see a tag Market Information. After clicking into Market Information, you can find free real-time basic quote under Quote. To search your desired stock, you can follow the steps below. What is the tooltips in Quote for? Tooltips button defines some financial ratio or function. When you over the mouse over the green question mark, you can understand more about the details of the financial ratio or function. How to search for a stock report in Stock Report Dashboard? Click on a market you are interested in, e.g. Hong Kong. Choose a sector you are interested in. Choose among stock ratings, price performance, fundamental and relative valuation. How to change the market view? What is the effect after changing? By using the change view market option, you can select the desired market (e.g. Hong Kong, SH-HK Connect and SZ-HK Connect.). The SR+ dashboard page content will be amended to display the relevant market view according to your market view selection. How to change the sector view? What is the effect after changing? By using the change view section option, you can select the desired sector to view (e.g. Banking Services, Real estate, Insurance, Energy and etc). The SR+ dashboard page content will be amended to display the relevant sector information according to your sector view selection. If I want to further know the report detail of the stock I am interested in on Stock Report Dashboard, what should I do? If the report of the stock you are interested in is available, you can click the Average Score of stock and you will be redirected to the corresponding stock report summary page. How to change market view in Sector Heatmap? What is the effect after changing? By using the change view market option, you can select the desired market (e.g. Hong Kong, SH-HK Connect, SZ-HK Connect, Shanghai A or Shenzhen A.). The Sector Heatmap page content will be amended to display the relevant market information according to your market view selection. How to change period view in Sector Heatmap? What is the effect after changing? By using the change view period option, you can select the desired period to view (e.g. 1 day, 1 week, 1 month and 6 months). The sector overview page content will show the relevant market information according to your period view selection. What is the meaning of Top/ Bottom Performing Sectors? The top and bottom performing economic sectors will be picked and displayed to give you an easier view of economic sector performance according to your market and period view selection. How to interpret the Sector Heatmap? The Heatmap tracks the sector performance of market in selected period by coloured pieces and each coloured piece represents a sector or a group of stocks. Green pieces show positive change, while red pieces show negative changes. The colour gradient is determined by the value of the indicator at the upper left. Higher gain or loss in performance represent by deeper colour. The size# of rectangle represents the market cap / turnover. You can click the sector piece to zoom into the stocks of the sector. You can also click the stock piece to view stock performance chart in 5-min/ daily/ weekly/ monthly candles. #Ceiling and floor size of colored pieces are applied to Sector Heatmap to ensure proper display. If I am interested in particular economic sector in Sector Heatmap, what should I do? The colored piece of Sector Heatmap. How to use Stock Report +? There are Average Score, Peer Comparison, Component Scores, Thomson Reuters Broker Rating on Stock Report +. You can check the score trend of the stock, sector and peer stocks under these parts in the report. The average scores are presented on a five-point standardized scale. Average Score is a weekly Score combines a quantitative analysis of five widely-used investment decision making tools - Earnings, Price Momentum, Fundamental, Relative Valuation and Risk. The definitions are as below. Earnings score: The score is based on a combination of three component factors: earnings surprises, estimate revisions, and recommendation changes. Price momentum score: The score is based on a combination of two technical performance factors: Relative Strength and Seasonality. Fundamental score: The score is based on a combination of four component factors: Profitability, Debt, Earnings Quality, and Dividend. Relative valuation score: The score is based on a combination of three component factors: Price to Sales, Trailing P/E, and Forward P/E. Risk Rating: It is derived by looking at a series of long-term (5-year) and short-term (90-day) stock performance measures including magnitude of returns, volatility, beta, and correlation. How to use A+H Performance? You can check the price difference of A and H shares between Hong Kong and China market. You can see a A+H selection bar showing according to H Vs A Share Discount/ Premium %. The default setting shows all A+H stocks. You can deselect/ select the stocks based on the discount/ premium %. What is the meaning of *HKD Eqv. in A+H Performance? *HKD Eqv. is the estimated price by converting the CNY price of the stock with the CNY/HKD exchange rate of previous day. The price is rounded to 2 decimal places for display purpose. How to interpret the discount/ premium percentage in A+H Performance? The discount or premium percentage is defined as the percentage change of the price of H-share relative to the HKD equivalent price (by converting the CNY price of the stock with the CNY/HKD exchange rate of previous day) of A-share. If I want to know the highest/ least discount percentage, what should I do in A+H Performance? Sorting feature is supported for the discount and premium columns, so you are able to view the discount or premium percentage in ascending/ descending order. How to use Sector Comparison? The Sector Comparison presents the sector performance of Hong Kong stock market in different time durations. The Colour of sectors represents the change of performance, with green meaning rise and red meaning drop. Deeper colour means larger change. The chart on the right displays the selected sector price performance comparing to the equity benchmark, i.e. Hang Seng Index. The constituent stocks in the sector are shown in the table underneath. What is Thomson Reuters Broker Rating? It is the mean recommendation from all analysis covering the company on a standardized 5-point scale (Positive, Neutral to Positive, Neutral, Neutral to Negative and Negative). Why does market information from online securities trading platform deviate from other sources? Every source adopts different assumption and definition of stock data ratio. The information provided by different service providers may cause the differences. What is the definition of PE ratio (TTM) shown on Online Securities Trading System? PE ratio (TTM) is ratio of stock price to earnings per share on Trailing Twelve Months basis. TTM refers to trailing update of the information on last four quarters. Please note that companies publish unaudited information in semi annual, 3 months or 9 months reports, and only publish audited information during annual report. 2FA is a two-step authentication method that requires not only a username and password but also information only known by the user. It is to help reduce the chances of identity theft on the internet or phishing via email. Thus 2FA is an enhanced security control over online banking activities to mitigate cyber security risk. What channel(s) will require the use of One Time Password (OTP)? From the end of April 2018, clients logging into Online Securities Trading platform and SC Equities mobile app will receive OTP via SMS and are required to key in the received One Time Password in order to log into the relevant system. When will I receive email notification when using securities services? You have to register or update a valid email address with the Bank and ensure sufficient space of the registered email box in order to avoid any disruption of online securities services. When will 2FA be effective on Online Securities Trading (OST) and SC Equities respectively? The Bank has implemented 2FA by means of OTP SMS since June 2016. Clients have to receive One Time Password (OTP) via the registered mobile phone number in order to access online securities trading platform. OTP had been extended to SC Equities from 27 Apr 2018, clients will receive OTP via the registered mobile phone number for login SC Equities. Clients have to register or update a valid mobile phone number with the Bank in order to avoid any disruption of online securities services. How do I register or update mobile phone and email address record? You can register or update your mobile phone number by accessing any branch of the bank. You can register or update your email address through Online Banking (Login Online Banking> Update Client Information> Update Profile) or accessing any branch of the Bank. The email address registration will be effective in next day after you receive the confirmation from the Bank. What if I only maintain mobile phone number but not email address with the Bank? If you have no email address record with the Bank, you will not be able to access the Bank’s online or mobile securities trading platform. You can register your valid email address upon online or mobile platform login to enjoy online and mobile securities trading services right away. Otherwise, you can still conduct securities trading through our Securities Hotlines (Priority Banking 2886 6000/ Premium Banking 2886 7000/ Easy Banking/ General Banking 2886 8000). Why does the Bank has to introduce 2FA? According to the requirements introduced by the Securities and Futures Commission (SFC) to enhance internet security and protection to the investors, additional controls are required over Internet trading, including the implementation of two-factor authentication (2FA). Therefore, starting from April 27, 2018, it will be a mandatory requirement for the Bank to implement 2FA mechanism for clients logging into online investment platforms. Why does the Bank has to obtain E mail address? According to the requirements introduced by the Securities and Futures Commission (SFC) to enhance internet security and protection to the investors, additional controls are required over Internet trading, including sending prompt notification to clients through a different channel used for 2FA upon logging into online investment platform.Therefore, starting from 16 July, 2018, the Bank will send clients a prompt notification through an email in addition to the 2FA (i.e. OTP via SMS) upon their login to online investment platforms. Other banks do not require to register E mail address, why the Bank requiress clients to register the email? Other banks may choose to adopt other means for 2FA and sending prompt notification, thus do not require email registration. The Bank is required to send prompt notification through a channel other than one used for 2FA and thus, client needs to register a valid email address for receiving the prompt notification. Will the Bank use my email address for other purpose? The Bank will use email address registered for the prompt notification purpose, including online login and transaction notification, or for communication of other marketing and/or servicing information etc. However, if you opt out from receiving marketing materials, you will not receive such information through the email address from the Bank. How to transfer my’ stock to other institute? You can manage the transfer of the stock at branches. What if I do not provide consent for Personal Information Collection Statement concerning China Connect Orders? The consent on Personal Information Collection Statement concerning China Connect Orders is required from individual client on the collection, storage, use, disclosure and transfer of his/ her personal information for China Connect Securities Services. Otherwise, the client can only place selling order for selling his/ her China Connect stocks holding(s). What is Northbound Trading Investor ID model? This model is for market monitoring and surveillance purpose only. What personal information will be passed to SEHK? Client identification Data (“CID”) will be passed to SEHK. For individual clients, CID includes name in English and Chinese (if applicable and available), ID issuing country, ID type and ID number. The information will be sent with BCAN to SEHK and thus the Mainland exchanges for their market surveillance of China Connect northbound trading activities. How can I provide the consent to the Bank? You can submit the consent through Online Securities Trading platform, our branches or by post. When should I submit the consent to the Bank? The consent on Personal Information Collection Statement concerning China Connect Orders should be provided by the Bank to SEHK one day before your first time of using China Connect Securities Services after the model becomes effective. However, it takes time to process your information and consent. We suggest you to provide the consent at least 3 business days prior to your first buy order of China securities. 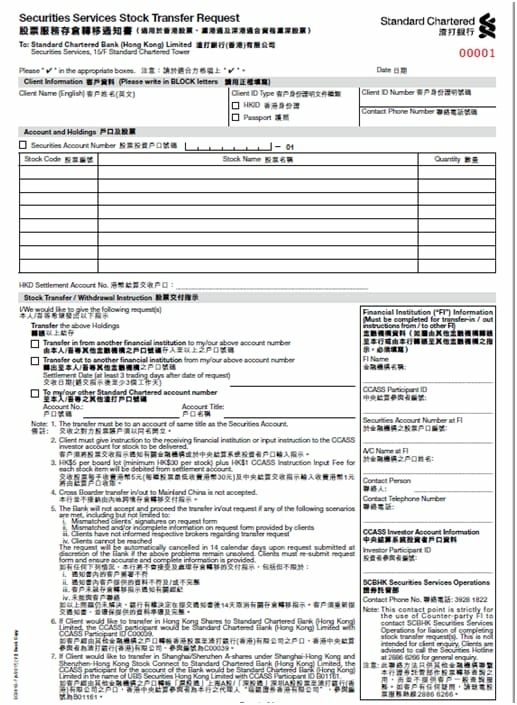 Is there any cut-off time for submitting the consent on Personal Information Collection Statement concerning China Connect Orders? Our cut-off time for clients to submit the consent through Online Securities Trading platform is 11 PM of business days. The cut-off time through branch would be 3:30 PM of business days. The above cut-off time would be changed without prior notice. How many BCAN do I have for China Connect Securities Services? You will have only 1 BCAN for your China Connect orders with the Bank. However, if you own a joint account, additional BCAN will be assigned to the joint account with the Bank. If you own a joint account (different pair of account holders), an additional BCAN will be assigned to this joint account. Will my personal Information be used by the third party, like your broker? As stated in Personal Information Collection Statement concerning China Connect Orders, the information will be used as required as part of the China Connect Securities Services by the Bank, its service providers and its execution broker. How Can I know the status of my submitted Consent Form? You can contact our Securities Services Hotline 2886 6266 for the consent status. When will the Northbound Investor ID model be launched? The model will be launched on 17 Sep 2018. When and how can I provide consent on Personal Information Collection Statement concerning China Connect Orders? From September 2018 onwards, you can accept the Statement through the Bank’s Online Securities Trading Platform.